I love this time of year - warm during the day, cool at night, and everyone just seems happier than in the middle of January! What a perfect excuse for a party. Last Saturday night we had about 15 of our friends over for a casual gathering on our deck. Since I was traveling all week before the party, I planned out a simple menu that could be prepped all in one day. This is something Jon begs me to make almost every weekend in the summer. It is very simple and delicious and reminds me of being in Mexico. - Chop and mix 10 tomatoes, 2-4 jalapenos with or without seeds, 1 small white onion, 1/2 bunch of fresh cilantro, and about 1 tbsp salt. Chill and serve with tortilla chips. Here is a picture of the pico from another time that I made it. Mash avocadoes with a fork to remove large chunks. Add onion, cilantro, lime, and sea salt. Keep a few of the pits to put in the guacamole when it is done as this helps to keep it from turning green. Stasia's Tip: If you buy avocadoes that are too firm for guacamole, place them in a brown bag overnight and this speeds up the ripening process. These bite sized appetizers are always a hit - I never have leftovers. 1 cup chopped veggies - I like using red and green peppers, red onion, and celery. Spread mixture onto tortilla; top with chopped veggies and cheddar cheese. Roll and place in a casserole dish and refrigerate for at least 6 hours. I like to keep them in the fridge overnight. Chop off the end of each tortilla and discard (or eat as you go along...); chop tortilla into bite sized pieces and serve. Each tortilla should give you 6-8 pieces. This appetizer includes another one of Jon's marinades. I sliced 15 chicken breasts into 3 pieces each and Jon marinated them in a mixture of tequila, lime juice, olive oil, cumin, and chili powder. They only needed to marinate for about 3 hours; any longer and the lime juice would have started to "cook" the chicken. Cilantro cream... this is simple, mild, and refreshing and went perfectly with the smokiness of the cumin in the chicken. I mixed 1 cup of sour cream with a handful of chopped fresh cilantro. Let it chill for about 1 hour before serving. I found this recipe on the Pillsbury website and changed it up just a bit. I'm not a fan of crab, but everyone said it was great and it went quickly. I served it with crackers (and really wish I had a picture!!). Add green onions, horseradish, mustard, crab meat, and cheese. Mix well. Transfer to a baking dish and bake on 375 for 20-25 minutes. 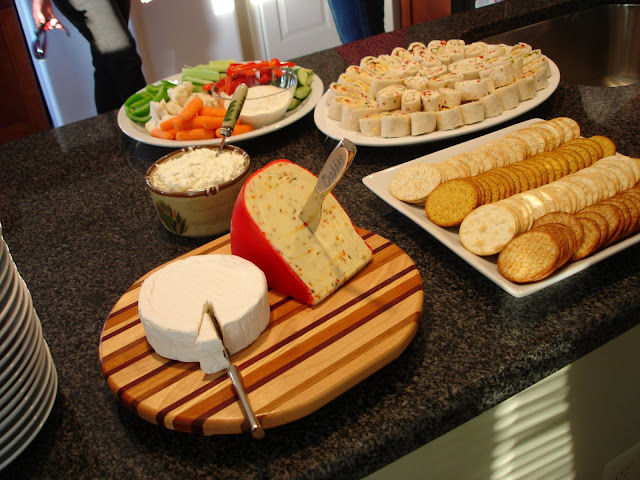 Cheese is a must at every party! I normally slice all of the cheese onto a plate, but Stasia arranged this cheese tray for me and it looked a lot better than how I usually do it. I had a bowl of garlic and herb Alouette, a wedge of jalapeno-cayenne cheddar that was oh so creamy and delicious, and a wheel of brie. I loved the way it all looked on this cutting board. Unfortunately I won't be able to use that cute little brie knife again because Jon dropped it into the garbage disposal when he was cleaning up...he blames it on the Scotch, but at least he did all of the clean-up, right?? Jenny loves to bake and brought another great dessert from the Williams-Sonoma recipe collection - Chocolate Chip Cookie Cake. Jenny doubled the recipe and turned it into a layer cake with strawberries in the middle. It was a great cake, not too sweet, and made you feel like you were eating a cookie! What a great spread. Everything is so beautifully plated. looks like a great party! I make a similar pinwheel appy, but may have to try yours next time around. Your get-together sounds really delicious! Sounds like a fun night! 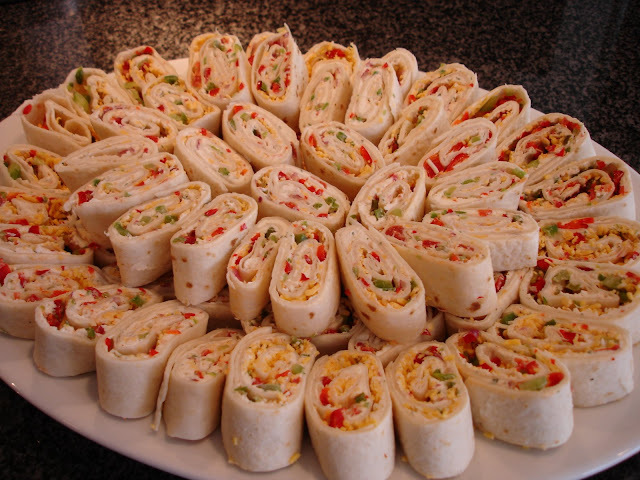 Tortilla pinwheels aren't teh fanciest, but they are always so popular at parties.